Contemporary house with clean lines, earth tones and a touch of modern Southwestern Flair. 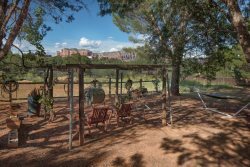 Located in a tranquil setting in the Chapel area of Sedona, yet close to trails and all that Sedona has to offer. Circular driveway with an abundance of lush trees for shade, yet open enough to enjoy the stunning views. Bonus private roof top deck with 360 degree majestic red rock views. As you enter this home into the charming sitting area you will notice the large picture windows, wood floors, contemporary art niches, lighting, ceiling fan and inviting wood fireplace. The delightful kitchen is fully equipped for all your entertaining needs. Design includes stainless steel appliances, granite counter tops, maple cabinets, electric stove, a center isle for meal preparation and a breakfast bar providing plenty of seating to entertain in the kitchen area over a cocktail or more formal eating in the adjacent dining room with seating for six. Master suite has a king size bed, subdued lighting, ceiling fan and patio doors to the private outside sitting area with wrought iron table, chairs, gas grill and umbrella. Master bath includes a walk in closet, rain head shower and a tub, elegantly finished with travertine tile floors. Second bedroom has a king sized bed and the third bedroom features two singles. Second bathroom boasts a contemporary finish; travertine floors and unique snail shower. This home comes compete with a media room furnished with comfortable leather couches, a large flat screen TV and card table. Looking for work space? - Bright professional office area with an abundance of counter top space and filing cabinets to enjoy work away from home. With so many windows, patios and decks this home is superior to most to enjoy the memorable red rocks views and Arizona Sunsets. Business: Nearby ATM, Post Office, Internet Cafe, FedEx, Bank, grocery store & hardware store, restaurants, etc. The team at Foothills was very helpful with all concerns and attended to any problems we had with the house in a timely manner. We wish there were more available properties in the West Sedona area to rent. We would definitely choose to rent from Foothills properties again. Thank you and the owner for a great stay. Both of you were very accommodating to us and our needs.